This was the second sketch I completed at this year’s Astrofest back in July. M22 is a true jewel of the night sky. This giant globular cluster from a dark site it can be a naked eye object as well. It is large enough for even smaller telescopes to resolve its multitude of component stars, revealing its large and intense core. M22 is beautiful in my 17.5” scope. It is very different from Omega Centauri and 47Tuc – could even describe it as the ‘runt’ of the giant globulars as its core is not as busy as its bigger brothers. But the component stars of its core are absolutely brilliant, arranged in so many signature patterns. It is slowly turning into a favourite of mine with its understated brilliance, loud without being overbearing presence, and sitting on a magnificent carpet of the Milky Way glow. Superb Alex ! What a good observation you did here ! Wonderful sketch! Your 2.5 hours of work payed off big time. Alex, It is a beauty to behold and you have captured it Brilliantly. Wow! 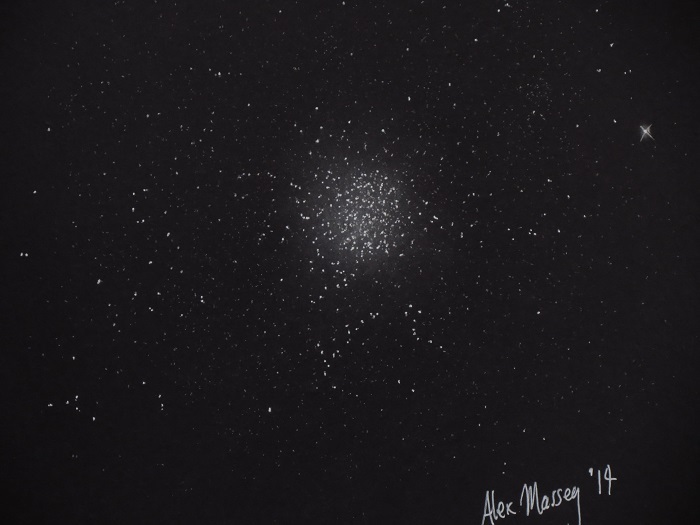 The best globular cluster sketch I’ve ever seen!!! It’s wonderful. This one really makes me feel like I am flying in space and part of the globular. Beautiful work mate!